1. (83) Charlie Kimball, Honda, 222.556. 2. (9) Scott Dixon, Honda, 222.516. 3. (98) Alexander Rossi, Honda, 222.442. 4. (10) Tony Kanaan, Honda, 222.007. 5. (18) Tristan Vautier, Honda, 221.801. 6. (8) Max Chilton, Honda, 221.654. 7. (7) Mikhail Aleshin, Honda, 221.489. 8. (26) Takuma Sato, Honda, 221.458. 9. (12) Will Power, Chevrolet, 221.277. 10. (3) Helio Castroneves, Chevrolet, 221.200. 11. (15) Graham Rahal, Honda, 220.954. 12. (1) Simon Pagenaud, Chevrolet, 220.845. 13. (28) Ryan Hunter-Reay, Honda, 220.707. 14. (20) Ed Carpenter, Chevrolet, 220.487. 15. (27) Marco Andretti, Honda, 220.318. 16. (5) James Hinchcliffe, Honda, 220.004. 17. (2) Josef Newgarden, Chevrolet, 219.947. 18. (21) JR Hildebrand, Chevrolet, 218.960. 19. (19) Ed Jones, Honda, 217.315. 20. (88) Gabby Chaves, Chevrolet, 215.562. 21. (4) Conor Daly, Chevrolet, 215.521. 22. (14) Carlos Munoz, Chevrolet, did not qualify. FORT WORTH, Texas – Charlie Kimball woke up to the rain Friday and had flashbacks to last season, when the IndyCar race in Texas was finished 2 1/2 months after it started because of wet weather. “But it was incredible, as soon as the rain stopped, the track dryers went to work and it did not take very long to dry,” Kimball said. Kimball, who earned his first IndyCar Series pole, and everyone else quickly got going fast on the 1 1/2-mile track that was completely repaved earlier this year. With his two-lap average speed of 222.556 mph Friday, Kimball was more than 3 mph faster than the previous Texas two-lap record – Will Power averaged 219.182 mph four years ago. There were 17 drivers Friday who qualified faster than Power’s average in 2013. Kimball’s first pole comes in his 109th career start. Series points leader Scott Dixon, his Chip Ganassi Racing teammate, will start on the front row alongside him after his qualifying run of 222.516 mph. “Knew that would be the benchmark,” Kimball said. 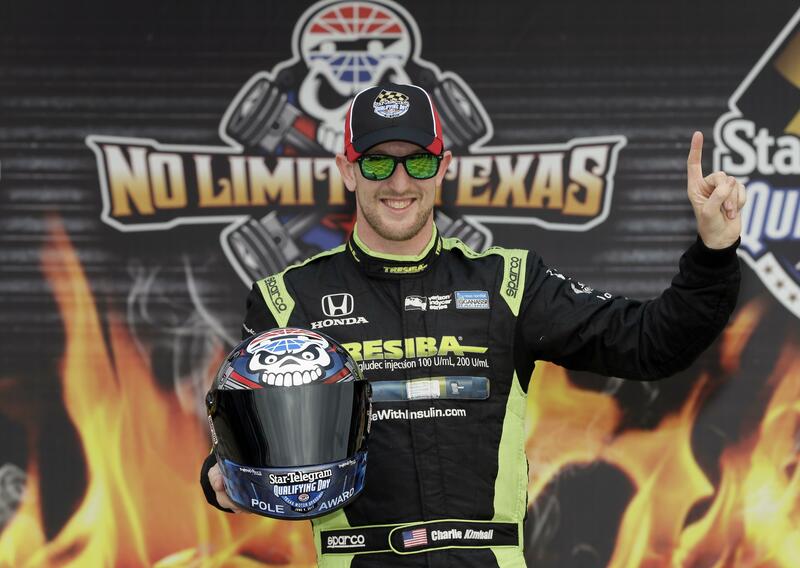 When Dixon drove more than 220 mph in testing at Texas in April, he did so in Kimball’s No. 83. Alexander Rossi qualified third, ahead of Tony Kanaan and Tristan Vautier, who is filling in for injured Sebastien Bourdais. Graham Rahal, the defending Texas winner who last weekend won both races in Detroit, will start 11th after a 220.954 mph average. The IndyCar race at Texas last summer started on June 12 and ended Aug. 27. The race was red-flagged because of rain after 71 of 248 scheduled laps June 12, after having been postponed a day. Texas decided to repave the track and do extensive drainage improvements after both NASCAR weekends last year also were hampered by rain. The old asphalt had become porous, almost like sponge, making it difficult to dry in a timely matter. Published: June 9, 2017, 2:35 p.m. Updated: June 9, 2017, 5:03 p.m.